previously played dead rubber losses. This weekend was quite nice for a change, no? 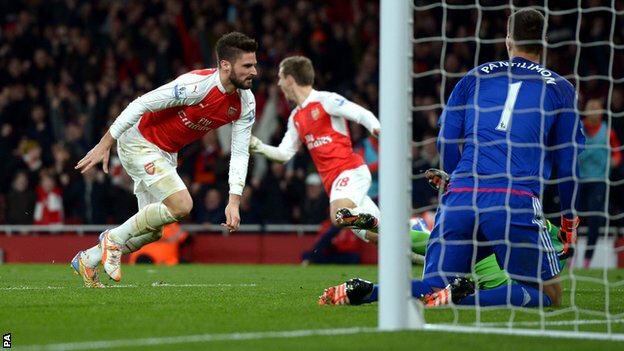 Arsenal huffed and puffed their way to a 3-1 win over their newly minted FA Cup Third Round opponent, Sunderland. Elsewhere, Manchester City lost at Stoke, Chelsea lost hilariously to Bournemouth, Liverpool lost at Newcastle, Manchester United were held at Old Trafford by West Ham, and Spurs were held to a draw by West Brom. Arsenal are back into second place, just two points back of first place Leicester City. Yes, that's still a thing. Yes, it is the second week of December. But now, Arsenal's European fate hangs in the balance. You know the situations and permutations by now. Essentially, Arsenal need to beat Olympiacos better than they themselves were beaten by Olympiacos on matchday two in order to advance to the knockout phase of the Champions League. If they do not, they will be "transferred" (that's the official term) to the Europa League. Beating Olympiacos by the same exact scoreline that Arsenal were beaten by back in October would see the Gunners through on overall goal difference. The ins and outs of Arsenal's injury list did not change over the weekend; Theo Walcott returned to action from the bench for the first time since injuring himself against Sheffield Wednesday while Alex Oxlade-Chamberlain started for the first time since injuring himself against Sheffield Wednesday. As for players who injured themselves against Norwich City, Alexis Sanchez is likely to still miss at least two weeks and is taking a winter break while bringing Christmas to Chile. Meanwhile, Santi Cazorla has had surgery on his torn knee ligament, so here's to hoping he recovers faster than Arsenal players normally do. As for players who injured themselves against West Bromwich Albion, it'll still be February for Francis Coquelin and I have no idea when Mikel Arteta will be over his chronic calf problem. Suddenly, some of Arsenal's fastest returns (aside from maybe Arteta and hopefully Alexis) will be the previously "long-term" injured, as Jack Wilshere, Tomas Rosicky, and Danny Welbeck prepare themselves for January LANS status. With regards to the XI for tonight, I can't see there being changes from the side that beat Sunderland at the weekend, unless the manager thinks Theo is fit to start. FYI, Joel Campbell and Mesut Ozil both face an accumulation ban with their next booking. Predicted XI: Cech, Bellerin, Mertesacker, Koscielny, Monreal, Flamini, Ramsey, Campbell, Oxlade-Chamberlain, Ozil, Giroud. matchday two, is a doubt with a calf injury. Olympiacos will be without Giannis Maniatis, who has been out since March with a knee injury, as well as Andreas Bouchalakis, who has been out since August with a quadriceps problem. Felipe Pardo, who scored in the reverse fixture, has missed the last three games with a calf injury and is a doubt. Tactically, Olympiacos's formation will obviously be influenced by the fact that they have the advantage here; the merely need a draw or a low-scoring one-goal loss to advance to the knockout phase. In addition, they have averaged the fourth-lowest percentage of possession out of all 32 Champions League clubs this season, meaning there's no reason to expect the Greek side to come out firing. As with Arsenal, Olympiacos have a number of players who will incur a suspension with their next booking; in this case, they are Esteban Cambiasso and Omar Elabdellaoui. Predicted XI: Roberto, Elabdellaoui, Botia, Slovas, Masuaku, Cambiasso, Millvojevic, Fortounis, Seba, Hernani, Ideye. Saturday, even with Olivier Giroud scoring in both nets. Arsenal's win over Sunderland at the weekend was quite welcome; the Gunners had won just two of their last seven across all competitions. In that time span, Arsenal crashed out of the League Cup and pushed their Champions League campaign to the precipice on which they currently stand. As for their position in the league, well, so many other teams have dropped points that Arsenal's league standing is still decent, in spite of the five points dropped at West Brom and Norwich combined. As for Olympiacos, their record this season is 100% in the league and 100% in European matches not against Bayern Munich. Olympiacos have won all 12 of their Greek domestic fixtures this season, opening up a 10-point lead on second place AEK Athens at the top of the table. They are unbeaten in their domestic cup, which opens with a round robin group stage. They also have three wins in Europe, but their two losses against Bayern Munich combined with Arsenal's win over the German side in London on matchday three has left the door open for Arsenal to qualify for the round of 16. 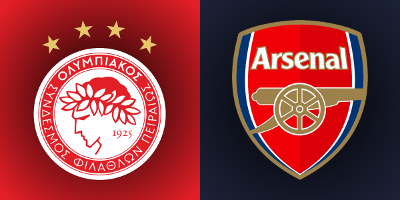 Olympiacos won the reverse fixture in stunning fashion, 3-2, on matchday two at the Emirates. 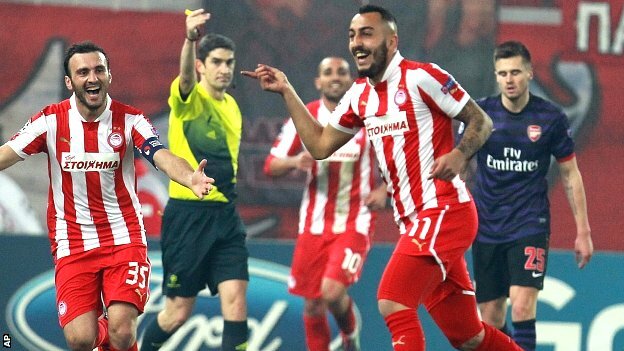 Arsenal came from behind to equalize twice, only for Olympiacos to re-take the lead each time. Felipe Pardo opened the scoring for the Greek side, but Theo Walcott equalized for Arsenal two minutes later. Five minutes after that, David Ospina's howler gave Olympiacos a 2-1 halftime lead. Alexis Sanchez equalized for Arsenal in the 65th minute, but the Greeks were ahead again a minute later, through Alfred Finnbogason, whose goal turned out to be the winner. 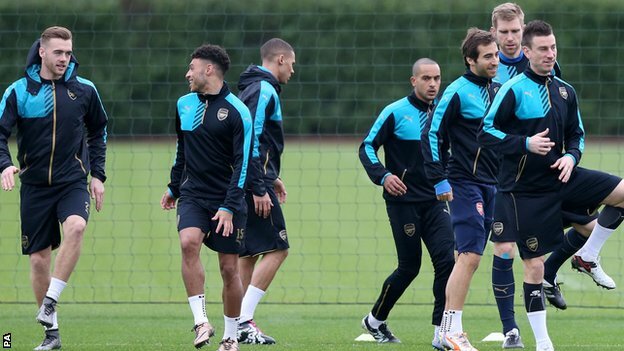 Arsenal have played Olympiacos in the 2009, 2011, and 2012 group stages and have lost in Greece all three times. Of course, all three of those previous meetings came on matchday six, much like this one, but Arsenal had already qualified for the knockout phase by that point on each occasion. For example, Arsenal's starting center backs for the meeting in 2012 were an out of favor Thomas Vermaelen and Sebastien Squillaci. Jernade Meade started at left back. Marouane Chamakh started up top. Arsenal still led 1-0 at halftime, but went on to lose 2-1.
getting clattered by a roaming Manuel Neuer. The match officials are from Italy; the referee is Nicola Rizzoli. Arsenal have a mixed record with Rizzoli in the middle, winning one, losing one, and drawing one. The win was a huge one, of course, being the 2-1 win over Barcelona at the Emirates in the first leg of the 2011 Round of 16 (oh, how long ago that feels now.) 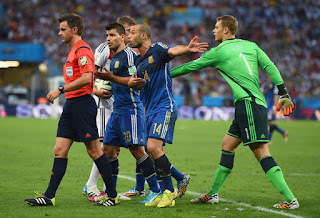 The loss came to Bayern Munich, 2-0, in the first leg of the 2014 Round of 16, in which Wojciech Szczesny was sent off. The draw came 2-2 at Schalke in the 2012 group stage. Olympiacos have split their results with Rizzoli in the Champions League as well, winning 1-0 at Marseille in the 2011 group stage, but losing 2-0 at Standard Liege in the 2009 group stage. Incidentally, Arsenal was in their group in both of those years. John Painting is a contributing writer to the Modern Gooner and a string of Christmas lights. You can follow him on Twitter @zorrocat to take part in some holiday cheer. Or not, whatever.